The lack of tall native trees along the banks of the Green River and its tributaries causes unhealthy and sometimes lethal conditions for Chinook and other salmon. 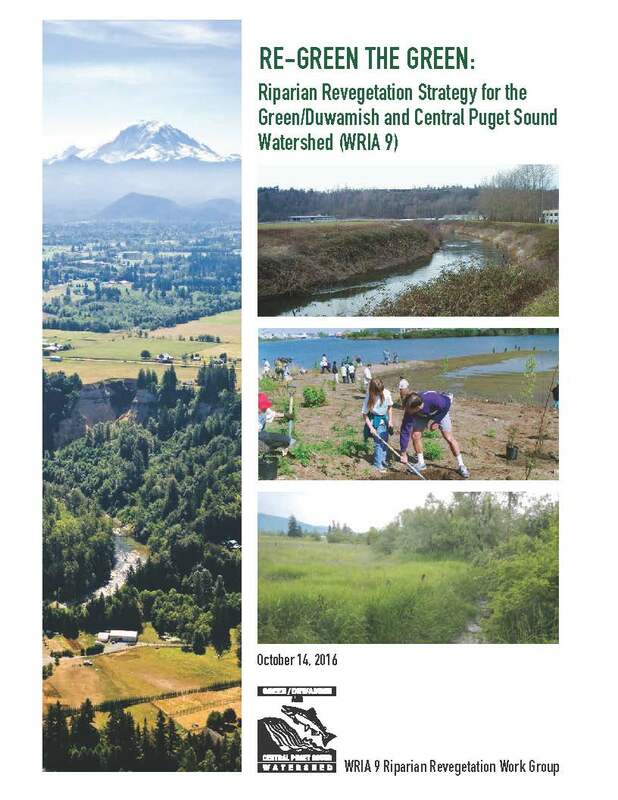 In 2016 the WRIA 9 Riparian Revegetation Work Group developed the Re-Green the Green: Riparian Revegetation Strategy for the Green/Duwamish and Central Puget Sound Watershed (Adobe Acrobat) (2.41 MB). A new interactive map to track planting locations and progress. The Re-Green the Green Riparian Revegetation Grant program supports projects designed to enhance riparian vegetation along the Green/Duwamish River and its tributaries within WRIA 9. The WRIA 9 Forum is eager to assist private non-profit corporations (501(c)3 status), tribal governments, local governments (City, County), Conservation Districts, and schools in funding projects that help improve conditions for salmon and water quality in the Green/Duwamish and Central Puget Sound watershed. Information about other projects and programs underway or planned in the watershed can be found in the WRIA 9 Salmon Habitat Plan. This fund supports projects that enhance riparian shade to improve conditions for salmon and meet water quality standards. There is a need to restore trees and native vegetation on all land use types, urban and rural, along the entire length of the Green River and its tributaries. Riparian revegetation projects improve water quality, salmon habitat, and contribute to the urban tree canopy. WRIA 9’s 2016 Re-Green the Green: Riparian Revegetation Strategy for the Green/Duwamish and Central Puget Sound Watershed provides important background, scientific basis, and identifies priorities for revegetation projects, including the banks of the rivers and streams mapped as high shade priority based on their solar sun angle or aspect. Anticipated funding available is $250,000 with a $7,500 minimum grant award and a maximum award of $60,000.